Please note: All prices are based from Nottingham City Centre. We offer standard taxis, minibuses and even executive cars for airport transfers from Nottingham. The prices quoted are for a standard taxi, please call us if you require a minibus or executive car. Drop off and pick up parking fees that are charged by the airports will be added to the price. When you’re going on holiday or on a business trip, getting to and from the airport can be one of the most stressful things in the world. Luckily, Yellow Cars are here to take the stress out of the situation with the airport transfers service we offer. Our drivers are friendly and reliable, they’ll make sure that you get to the airport on time and that they’re waiting for you when you get home. We even take your flight numbers so we can check whether your flight has been delayed and if it has we can simply arrange for your taxi to be waiting for you when you get in. 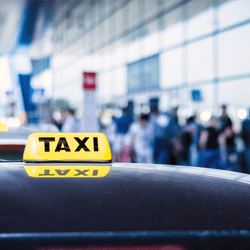 We offer fixed pricing on all airport transfers and cover all major airports in the UK, whether you’re in need of an airport transfer to Birmingham International Airport, Heathrow or even East Midlands. If you want to book an airport transfer, please call us and we'll be happy to help.